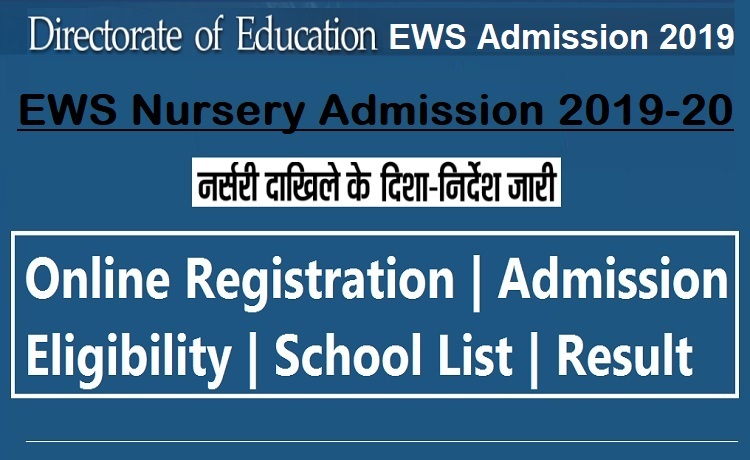 EWS Nursery Admission 2019-20 admission process was started on December 15 and the last date to submit the filled EWS Nursery Admission 2019-20 Application form is January 7. The admission process will end on March 31. In Delhi, there are 1697 private schools in which the admission process was started on Saturday, December 15. For admission to the entry-level class, schools have ruled out admission criteria which are compulsory to be followed by applicants. It includes distance from school criteria, first child, single child, parents of children must have studied in the same school, brother-sister reservation etc. According to the notice issued by Directorate of Education, parents can submit the application form from Saturday onward and the last day to submit EWS Nursery Admission form for the academic session 2019-20 will be January 7. The first list of selected candidates will be declared on February 4 followed by the second list on February 21. Nursery Admission 2019-20 process will end on March 31. One to Twenty-Five percent of seats in Delhi private schools will be reserved for candidates belonging to Economically Weaker Section and Disadvantaged Group. As per the direction from Directorate of Education, schools have to upload the open seat details on their official website by December 14. For Nursery Admission, Minimum age should be – 3 years, Maximum age should be – 4 years. On December 16, Directorate of Education, Delhi issued a notification which reads that the schools who have failed to upload the admission criteria will not be allowed to continue the admission process for the session 2019-20. Out of 1697 Delhi private schools, 1650 schools have uploaded their admission criteria successfully. According to an official of the Education Department, the schools which are not uploading their admission criteria, have made nursery admission criteria very easy for general category. Moreover, the education department have taken a notice of it and the admission criteria uploaded by the schools is under observation.